Discussion in 'Political Opinions & Beliefs' started by TrumpTrain, Aug 11, 2018. The next time you Democrats and Liberals yell "Nazi", just look in the mirror and you'll see the biggest Nazi of them all. logical1 and JakeJ like this. Does the Republican party accept membership from Germans? You have to be an American to participate in American politics. Not sure why they would accept membership from foreign Nationals. You got to be kidding. Hitler's ideology was to promote the Aryan race. He saw everyone who wasn't white and didn't have blue eyes (Aryans, his ideal of superior genes) as deviants and subhuman, not worthy to live and who needed to be weeded out. That included Jews, but also gays and transgenders, all were seen as abnormal. Thus, they were put in concentration camps. Yet another thread from the right based on a highly ignorant op. Maybe you should stick to photos after all. Sexual deviance differs from individual to individual, but it's of no surprise(and certainly not to the extent of Hitler's vision) that most people would view gays/transgenders as 'abnormal'/strange. In fact, from their perspective it's quite a logical conclusion. Hitler used the phrases of 'abnormal'/'strange' to a political persecution purpose, not a natural outlining of differences in a sexual or psychological nature. To conflate these two, is to conflate not only conservative views of sexuality but even liberal heterosexuals who also don't feel sexually attracted to members of the LBGT community. What has the right wing done to gays and transgenders? Fought against letting them get married? Marriage is merely an insurance policy to let a woman know it's safe(ish) to let a man impregnate her, and knowing that he won't leave. Gays don't really need that, considering the chances of pregnancy are fairly remote. Just realize that while you're thinking that gays and ladyboys are seen as abnormal, the democrats have antifa running around attacking anybody who is conservative. The only difference between antifa and the brown shirts is... well, they wear black rather than brown. It's not a question of the democrats having their way. They do have their way in some places, and they employ actual violence. Real people are really getting attacked. How much violence has there been against gays? This is one of those Forest Gump threads ... "Mama says stupid is as stupid does...." and this thread is stupid. and their military service dishonored. Finally, gay people fought for the right to get married to the person they loved and you think from the howls and screams of the right wing, that gays were torturing the dudes. So please, just stop with the innocent bull crap when it comes to conservatives and gay rights. Anita Bryant doxed gay people? You mean like the democrats do on a daily basis? Besides, if all you have is one lady who wanted to repeal a law making it illegal to discriminate against gays, then you've got nothing. The NAZIs hated Socialists and Communists, who were their first victims. They were the first to go to Concentration Camps. The Nazis also totally embraced large private for-profit corporations and wealthy businessmen. Meanwhile Socialists rejected such people as greedy capitalists and seized their property. The Nazis murdered many left-leaning Nazis in the Long Knives Purge. just cause they used the term "socialist" in their name doesn't mean they embraced any of the core beliefs of Socialism. the racist right-wing party in Germany today is called the Republicans. Iran has a Republican party who is very Islamist. the left-wing Irish terrorists are the Republicans. The Nazis WERE socialists. You are not entitled to your own alternate reality. Hitler did what all socialists do, government control of industry and peoples' lives. And? What has that got to do with the OP? And while we're at it, plenty of black and Hispanic groups here promote their races. I don't hear you complaining about that. Do you know what La Raza is really all about? I doubt it. People who hate facts always call the truth "ignorant". We know you hate the truth. and yet their first victims were Socialists and Communists. and the Nazis LOVED wealthy capitalists and their for-profit private industries. that's not socialism, by any modern definition. TRUE Socialists are very skeptical and suspicious of wealthy capitalists and usually despise them as profiting off the labor of the working man. Oh look at all the "Republican" parties that the OP would say are not true Republicans. But the Communist and Socialists killed 100 million of their own people using their own government, so I guess they are better than Nazi slightly. So yea, I think we should go Communist Democrats cause there are only 2 choices according to the Globalist media and I sure do not want to be called a racist Nazi, nor excluded from a potential delightful dining experience at the Red Hen Restaurant in Lexington Virginia. And I certainly do not wish to be denied watching Leftwing Marxist Hollywood movies featuring demented has been actors like Robert De Niro. What's in a name but to disguise the truth. Witness, when has their Labor Party done anything good for "labor"? KKK Democrats and Louis Farrakhan Democrats have a lot in common. I always remind liberals that Hitler was a liberal and that inside every liberal is a totalitarian screaming to get out. "We might have called ourselves the Liberal Party. We chose to call ourselves the National Socialists. We are not internationalists. Our socialism is national..."
Mussolini use to be a Communist before he became a fascist. Antifa was founded by the Kremlin during the early 1930's in Europe in response to Hitler and Mussolini. They called themselves anti-fascist but were nothing more than anarchist and Marxist who got their orders from Joseph Stalin. 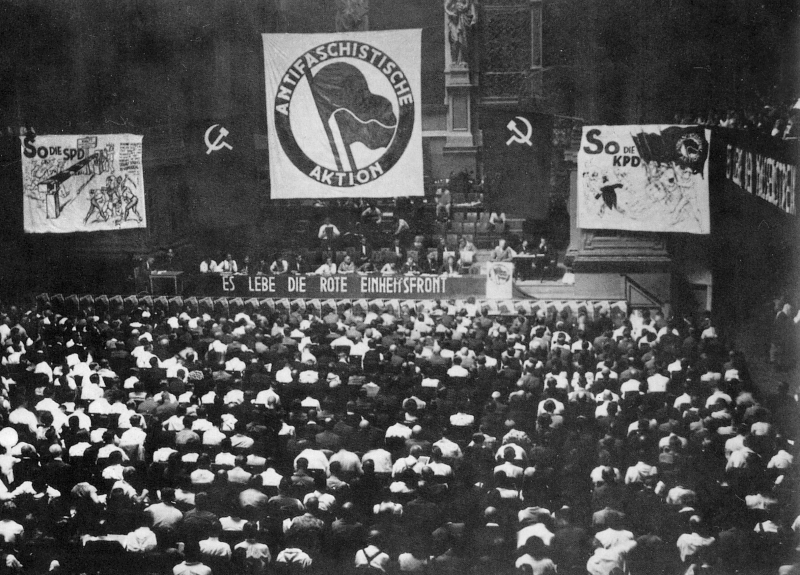 In the endgame, 85 years later Antifa are today's fascist, the militant arm of the Democratic party. JakeJ and TrumpTrain like this. Sorry, but you're going to have to do better than that because the entire narrative that nazis are right wing, the southern strategy... everything the democrats have been saying for decades is coming crashing down. No, only Americans and German-Americans who have been naturalized as American citizens who have adopted America's language, customs, traditions and the American way of life. There is no room in America for hyphenated-Americans. Guess you weren't around - it was a whole movement under a crap "Save the Children" campaign with tried to make it illegal for gay people to teach in schools, adopt, or to have rights to basic housing. She was backed by Jerry Falwell and the religious right. They got several laws passed in Florida that discriminated against gay people and tried to pass the same in California called the Briggs Initiative. It was stopped by a coalition of Democrats and Republicans including Ronald Reagan. A leftist calling Trump a Nazi is not about the economic system..
You do like yer progressives. I noticed the proof of your allegations is missing.. Yes, they have the same tailor.